Along with being a major life-changing experience, having a baby can be described in a number of other ways: amazing, magical, painful, emotional, unexplainable, enchanting, miraculous, and many, many more. But the list wouldn't be complete without expensive. When you start to add up the cost of diapers, car seats, strollers, blankets, outfits (just as a start), it's no wonder that the tradition of having a baby shower was started. When everyone comes together and pitches in to help the mother-to-be be prepared for her newborn's arrival, it just makes life more manageable and enjoyable for everyone! So, what happens when that baby shower is put on by three of the experts in the world of all things baby? 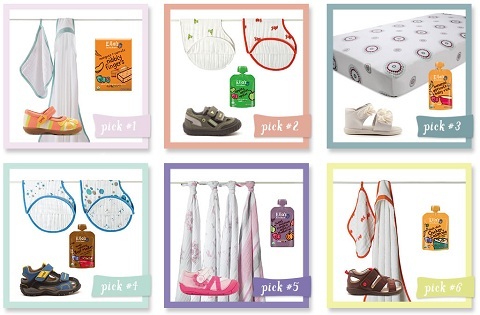 Then you'd have the Lucky Duck Baby Shower Sweepstakes! That's right! 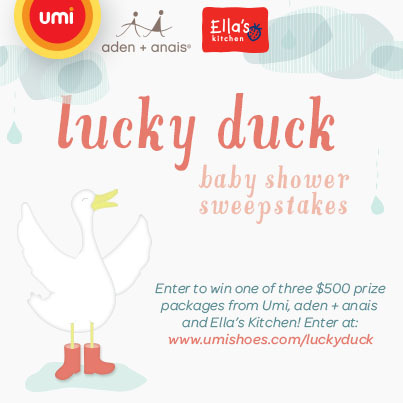 Umi has partnered with aiden + anais and Ella's Kitchen for a baby shower-themed promotion with some amazing prizes for THREE grand prize winners! Entering is simple — start by visiting the Lucky Duck Sweepstakes page and browse the six gorgeous outfit options that these three star brands have put together. After you've selected your favorite, you have the option to share it through Twitter, Facebook and Pinterest so that your friends and family can see which adorable baby options you love best. A variety of aiden + anais products (Swaddle 4-Pack, Burpy Bib, Crib Sheets, Changing Pad Covers, Towel + Washcloth Set) worth $158.85. That adds up to an approximate retail value of each grand prize as $508.85! This awesome sweepstakes started today, April 15th, and runs through May 5th, 2013, so be sure to head over and enter (limit one entry per person)! As a bonus, once you've entered you'll receive discount codes to use on your next Umi and aiden + anais purchases, as well as instructions for receiving a coupon to be used on Ella's Kitchen products. What are you waiting for? Go enter the Lucky Duck Sweepstakes today! Other than the information concerning this sweepstakes, I was not compensated or provided with anything. In exchange for sharing this information, I will be entered in a contest to win an Umi gift certificate of my own.